New Germany State Park will host the fourth annual EGGstreme Easter Egg Hunt on April 20 from 10 a.m. to 2 p.m. This event is designed for families to experience the outdoors together and will feature over 1,000 eggs strategically hidden along 10 miles of trails within the park. 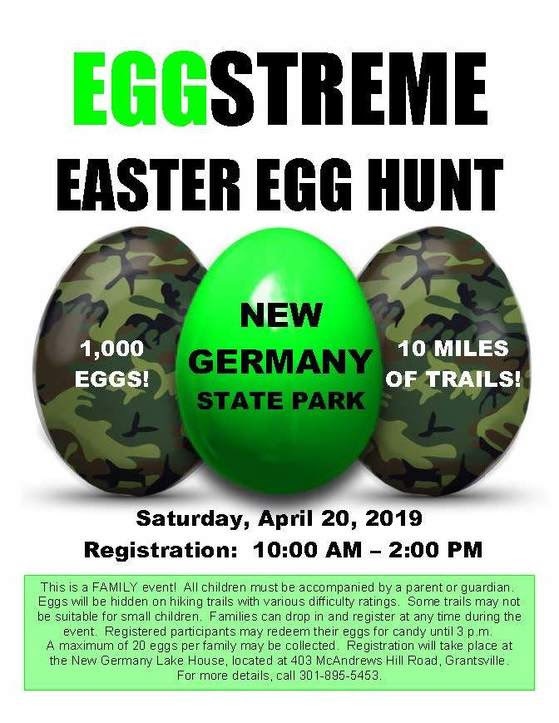 In support of this unique event, the Friends of New Germany State Park is seeking donations of candy and plastic eggs for participants. Candy must be store-bought and individually wrapped. For questions or to get involved as a volunteer, please email or call 301-895-5453.